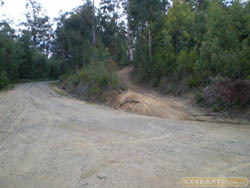 This track in in Bunyip State forest, it had been raining earlier, so the track was slightly slippery. There are some good hills, and erosion mounds. A fun track to drive. I had the track recording along the road to get there, and on the roads to get back out to the main Neerim road, as well.